Over the past decade, there’s been a strong shift in US television to include not only movie actors and actresses but those from different countries around the world. No longer is it dominated by familiar American faces but also the best of the UK, Australia and beyond. Hugh Laurie in House, Andrew Lincoln in The Walking Dead and Jonny Lee Miller in Elementary to name a few, it’s great to see these talents taken to the hearts of worldwide audiences. SyFy’s new supernatural action series Dominion certainly takes this approach with its cast – Christopher Egan formerly of Home and Away, everyone’s favourite ex-librarian Tony Head, and Alan Dale – forever known to a generation as Jim Robinson out of Neighbours – the man that seems to have appeared in every US TV show of the noughties. We had the chance to talk to one of the most popular up and coming homegrown stars we have in Roxanne McKee, well known for playing Louise Summers in Hollyoaks and more recently Doreah in Game of Thrones. Roxanne takes the role of Claire Riesen in Dominion, daughter of General Edward Riesen, the Lord Of The City and a man of much power. Claire is a teacher, caught in the middle of political struggle, constantly fighting to live by her own beliefs while surrounded by the influence of others. As heir to the throne, Claire’s destiny may be far beyond her control. SciFi Now UK spoke with Dominion’s Roxanne McKee. Interview excerpt is below. 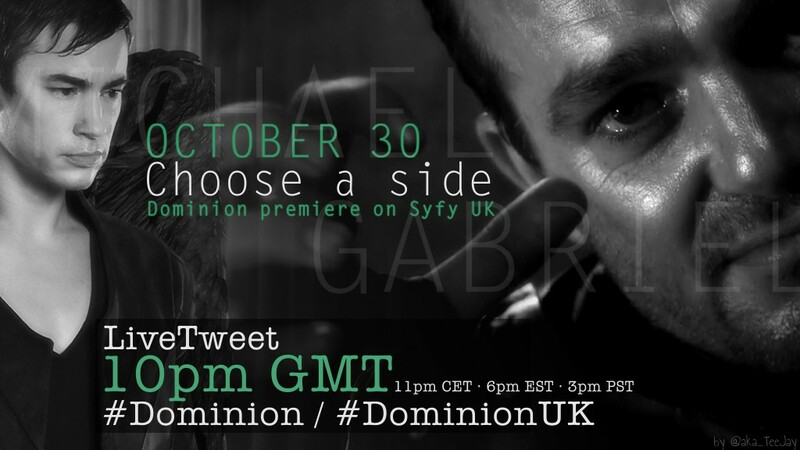 Dominion will premiere in the UK on Thursday October 30 on SyFy at 10 pm. We will be tweeting along with cast and fans during the UK premiere. With a second season already in the bag, Syfy’s show Dominion (based on the film Legion by Scott Stewart) has been a huge hit in the US. Now, we’re finally getting to see it here in the UK. Quick update for the UK live tweeting on Thursday: Vaun has confirmed that some of the UK based Dominion actors will join the tweetout. That’s wonderful news, and we hope you will all tweet along! UK live tweet coming on Thursday! Join us on Thursday (Oct 30) when we live tweet for the UK premiere of Dominion on Syfy UK! Live tweeting for the pilot episode begins at 10pm GMT (11pm CET, 6pm EST, 3pm PST). Please note that the time difference between US and Europe is one hour less this week due to a one week difference in change to winter time. 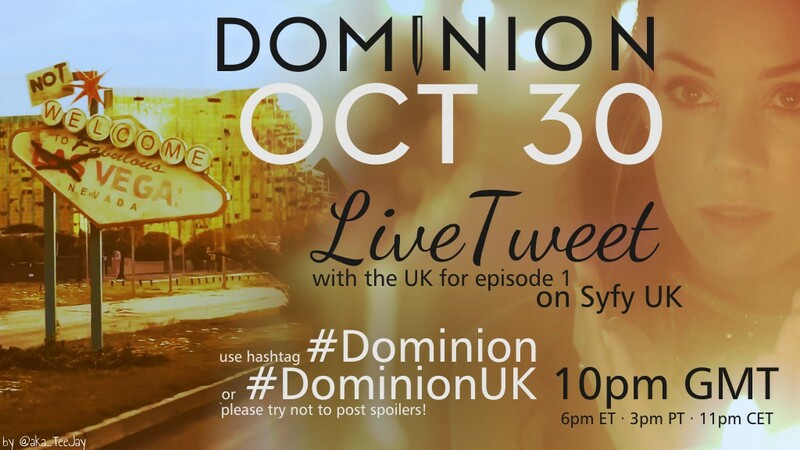 Hashtags to use should be either #Dominion or #DominionUK. Since most of the Dominion cast is UK or South Africa based, it’s entirely possible some of them might join the tweetout, which should be fun! Keep your eyes peeled. Please spread the word, and feel free to repost the graphic above (or this one) to do so. We’d like to ask that you don’t post spoilers during the tweetout in order not to ruin the experience for the UK audience. Happy Birthday to Amy Bailey! Today marks the birthday of Amy Bailey, the actress portraying Clementine. The Dominion fans would like to wish her all the best and a wonderful day! 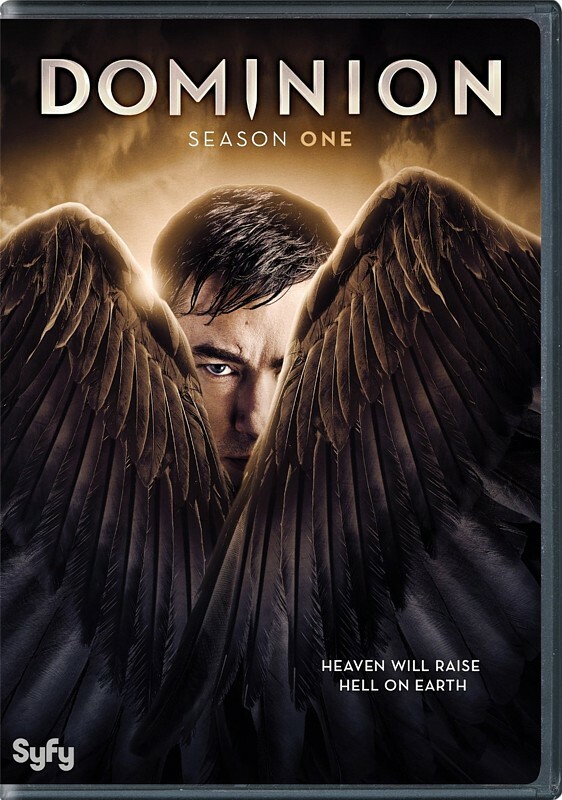 Vote for Dominion at the PCAs 2015! Voting for the People’s Choice Awards 2015 is now open, and Dominion is nominated in the Favorite Cable Sci-Fi/Fantasy TV Show category. Please go to the PCA voting website and make your voice count to support Dominion! Join us on Wednesday (Oct 22) and live tweet along with the Canadian and Spanish viewers when the show airs in their countries. For Spain, episode 4 “The Flood” airs on Syfy España at 10:25 PM CET (1:25 PM PT/4:25 PM ET). Please use the hashtag #DominionES. For Canada, the season finale “Beware Those Closest To You” airs on Showcase at 10 PM ET. Please use the hashtag #Dominion. Please spread the word, and feel free to repost the graphic above to do so. Please remember not to post spoilers if you’ve already seen the episodes! Syfy France will show episode 2 on Oct 21 at 8:45 PM CET. Come and join us to twee along with the French too. 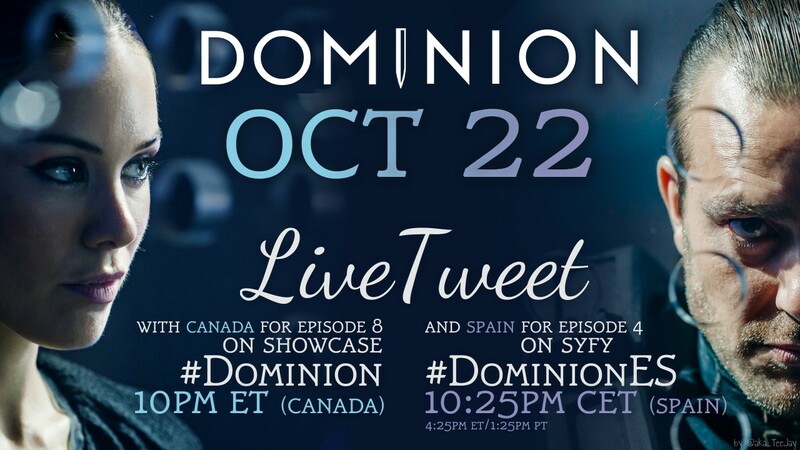 We’ll use hashtag #DominionFR. Congratulations on Dominion’s “Creativity International Awards” win! Congrats go out to the creative team at Syfy for winning two Creativity International Awards this year for Dominion key art. Well deserved! Syfy and Chiller won five awards for excellence in creative design, including wins for Syfy’s popular scripted series Dominion and Helix, at the prestigious 44th Annual Creativity International Awards, which included entries from 33 countries including the United States. Live tweet with Canada and Spain on Wednesday! Join us on Wednesday (Oct 15) and live tweet along with the Canadian and Spanish viewers when the show airs in their countries. For Spain, episode 3 “Broken Places” airs on Syfy España at 10:25 PM CET (1:25 PM PT/4:25 PM ET). Please use the hashtag #DominionES. For Canada, episode 7 “Ouroboros” airs on Showcase at 10 PM ET. Please use the hashtag #Dominion. Please spread the word, and feel free to repost the graphic above to do so. Dominion will also premiere on Syfy France tomorrow (Oct 14) at 8:45 PM CET. Might be fun to tweet along with the French too. The alternate ending for episode 1×08 is especially noteworthy because certain online sources hinted at a rather significant scene that ended up on the cutting room floor which should prove interesting to see!